or call (225) 757-6666 for Nicholson Dr. or (225) 248-6430 for Jefferson Hwy. Orders can only be guaranteed when placed at least 1-2 days in advance. For orders placed with less than 48 hours notice, please call rather than email. We will do our best to accommodate your catering needs. Prices are subject to change. If needed, please request napkins. Price doesn’t include delivery, tax or gratuity. A variety of our delicious savory kolaches, fresh out of the oven. Sub any kolache for a kolache of equal or lesser value at no charge. Ranchero – (n.) scrambled eggs, meat or veggies, melted cheese and a mild ranchero salsa stuffed inside our kolache dough. It’s just as delicious as you’d think. Sub any ranchero for a ranchero of equal or lesser value at no charge. Check out our Build Your Own Taco Bar for an interactive, memorable meal! Your choice of protein (shredded chicken, pulled pork or fajita steak), warm 6” flour tortillas, shredded lettuce, shredded cheese, freshly prepared Pico de Gallo, and house-made chipotle sour cream. A homemade sandwich, savory Mrs. Vickie’s Chips and a refreshing drink make the perfect meal! We can accommodate groups from 10-200+. You may either order a set number of sandwiches and chips OR use the below form for your guests to make decisions based on their preferences. Pricing is the same as the in-store sandwich, chips and drink pricing. Delivery is available on a case-by-case basis. A 24-hour notice is required. There is a minimum $15 delivery fee in the local Baton Rouge area. Delivery fees may vary—ask about pricing for your location. Please contact us at kolachekitchen.br@gmail.com for delivery inquiries. 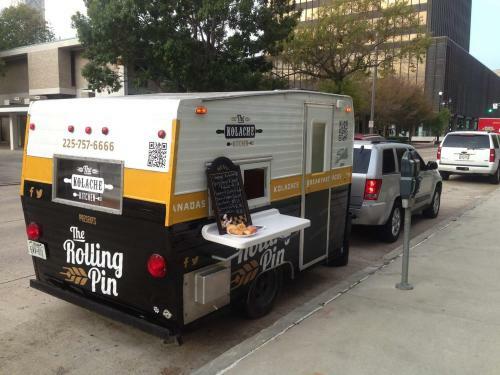 Our food truck, The Rolling Pin, is available on a case-by-case basis. Please contact us at kolachekitchen.br@gmail.com for inquiries. We can also take large orders 24 hours in advance using this form. We will call or email you to confirm your order.